WASHINGTON, DC, UNITED STATES, September 4, 2018 /EINPresswire.com/ -- Ms. Elena Camba Reyes, Manila, Philippines. 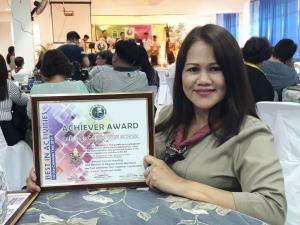 Ms. Reyes, an accomplished teacher who studied Education and received her Master's Degree at Marikina Polytechnic College has taught at several schools prior to becoming the principal at Graciano Lopez Jaena Elementary School (GLJES), in Manila, Philippines. The school currently has approximately 1500 vibrant and amazing students. "After meeting Ms. Reyes, the staff, the students, as well as the parents, it was clear to us that GLJES is the school we wish to support", said Perpetua Gaiter. Thomas Gaiter Foundation (TGF) provided school supplies, audio sound system and later purchased a much-needed water tank for the school. TGF continues to support this elementary school. Graciano Lopez Jaena Elementary School was named after a Filipino journalist, orator, and a national hero who is well known for his newspaper "La Solidaridad." Following GLJES, Ms. Reyes became the Head of Carlos P Garcia High School (CPGHS), named after a former President of the Philippines, who himself was a school teacher, a Congress Representative, and a governor prior to becoming President of the Philippines. CPGHS is located in Pandacan, Manila and has 1600 talented and brilliant students. TGF along with other stakeholders supported the "Sagot Kita" Project. The project's goal is to address the needs of Students At Risk of Dropping Out (SARDO) at the end of the school year. This endeavor has indeed been successful and we continue to support this project. She is indeed a leader and continues to inspire staff, students, and the community.